Kendril is a Ghostwalker, a man who is dead to his former life and bound by a solemn vow to seek penance for some mysterious dark sin in his past. When a chance encounter in the forest leads him to inadvertently rescue a woman named Jade, a woman who claims not to remember anything about who she is or what has happened to her, Kendril becomes her reluctant guardian. But after a gang of ruthless bounty hunters comes after Jade, Kendril finds himself thrown into a deadly game of cat and mouse where one wrong step will be his last. Now he must use every ounce of daring and cunning he has to escape with his life and to protect the woman he is growing to love, a woman with no past. But can he trust Jade, or will her secrets lead to his undoing? 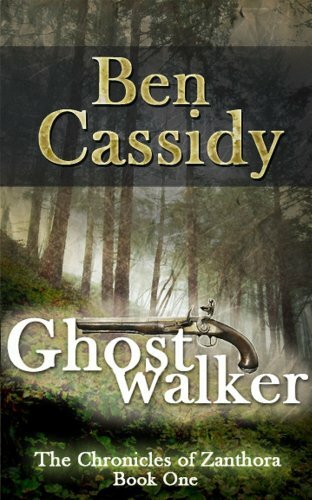 Ghostwalker is an action-packed novel of suspense set in the fantasy world of Zanthora. Filled with dark humor and a cast of diverse characters, it is the first book in the Chronicles of Zanthora, the relation of the Fourth War of Despair. Cover designed by Robert Worl.